A majority of the information used by the developer portal is stored on Apigee Edge. The portal acts as a client to Edge. As necessary, the developer portal sends an HTTP or HTTPS REST request to retrieve information from or send information to Edge. For example, when a developer registers a new app on the portal, the portal sends a request to Edge to store information about the app. All interactions between the developer portal and Edge are initiated by the portal. Edge does not make requests to the portal, it only responds to requests made from the portal. When an API developer completes the app registration process on the developer portal, the portal sends information about the app to Apigee Edge, including the app name and the API products associated with the app. If Edge registers the app successfully, Edge returns a single API key to the portal. The API developer uses that API key to access the API products associated with the app. Information about the apps and API keys is stored on Edge only; it is not stored on the portal. 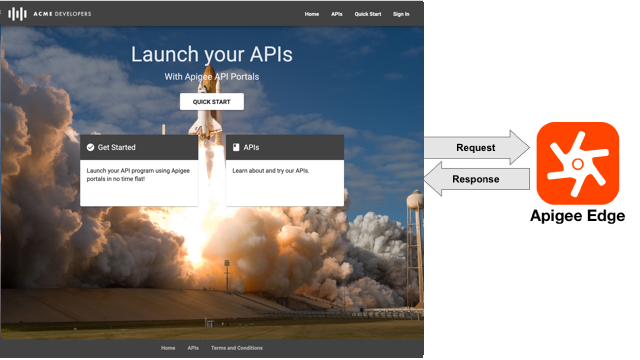 When an API developer uses the portal to view information about an app, via the My Apps page for example, the portal makes a request to Edge with the API key to access the information. Similarly, when an API developer adds, removes, or modifies an app, the portal sends the modifications to Edge to be stored. For more information, see Register apps and manage API keys. The email address is the primary key used by Edge to identify the API developer and each must be unique. From the primary key, Edge generates a unique developer ID for each organization to which the API developer belongs. You may need to use the developer ID to correlate an app with an API developer. For more information, see Register app developers.